By simply swallowing 2 or 3 capsules, Good Breath starts to work immediately on coffee, cigarette smoke or morning breath. Good Breath ensures close encounters of the best kind with fresh long-lasting breath whether you eat garlic, onions or spicy foods. Good breath goes directly to the source of these odors the digestive system itself! Finally, no more embarrassing moments when your date or mate avoids close contact with you after eating garlic or other offensive foods. Regular breath mints can only treat the surface of "yucky" breath odors and not their source. 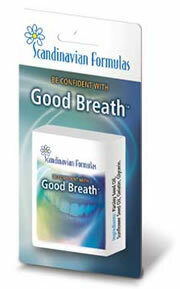 Good Breath contains no sugar, starch, artificial flavors, preservatives, dairy, corn and is sodium and yeast free. In addition to Good Breath, it is also very important to have daily oral hygiene along with yearly dental visits. "Works from the inside out." Good breath goes directly to the source of these odors – the digestive system itself! Finally, no more embarrassing moments when your date or mate avoids close contact with you after eating garlic or other offensive foods. Regular breath mints can only treat the surface of “yucky” breath odors and not their source.